Alex M. Bustillo is a Cuban-American graphic designer residing in France. He was born in Miami, Florida and has lived in the United States, Puerto Rico, Latin America, Italy and in France for the past 16 years. Alex treats photographic images as paintings across a wide variety of topics. He is interested in music, writing, and European travel, architecture, and history as the subject of his work. Alex is interested in Modernist and Postmodernist writers, artists and musicians. Alex creates web pages, logos and photographic collages in collaboration with his clients and interests. Alex invites you to visit the different pages of his website so you can get to know his work. Alex is interested in genealogical research, with his name listed as Alejandro Manuel Bustillo Martinez for genealogy purposes. You can visit his Geni.com Genealogy Page. Alan Vega: The Christ & The Passion of Punk. Alex treats photographic images as paintings across a wide variety of topics. He is interested in music, writing, and European travel, architecture and history as the subject of his work. Alex is interested in Modernist and Postmodernist writers, artists and musicians. Alex’s work can be produced as photographic prints, plexiglas transparencies or mounted on aluminium sheets. Alex prefers the production of aluminium mounted prints because of the paintlike quality that it lends to his images. Alex is an autodidact having begun his work as a hobby and this gives his work a specific visual signature which incorporates different cultural and technical influences. He has been pursuing his work for the past 6 years. Alex has participated in several expositions in the Paris area and one in Miami, Florida. His work has been sold in France, Italy, Australia, United States and Canada. Alex accepts commissions from individual clients. He works with the client on a particular subject or theme to create a visual representation for the client. He has worked with the well-known American musician Garland Jeffreys who approached him for some ideas about incorporating his musical work into a visual context. Alex, when was your first desire to become involved in the photography and graphic design? How did you did it start? Having always been interested in music, books, images and design a few years ago I decided that I wanted to create something but I was not sure what that would be. I did not have any training or discipline to draw upon and that was part of the challenge. I started to play with images, photos, textures to see what I could create. I had never used Photoshop, I didn’t paint, so I started to play and experiment with those tools and photography to see what I could create. That was the beginning. In the beginning, I was looking for a technical way to express. Now that I understand the technical aspect, the objective is to become the best reader, listener, and interpreter without imagining that I’m part of the work but always remain on the extended orbit. What does “Image” and “Art” mean to you and from whom have you have learned the most secrets about it? “Image” is anything I can capture through the senses. It can be a texture, a photo, a sound or smell. “Art” is the conscious or unconscious composition of images. I have learned from watching, listening, studying writers, musicians, painters, drawers and sculptors. I will begin a project with an obsession with a subject of interest and the set of images that arrive from that are my way of interacting with it. What characterize the philosophy of your art and how do you describe your progress? The characteristic philosophy of my art is synesthesia. I want to rearticulate subjective senses in a synesthesiac manner. Synesthesia is Sensation experienced in a part of the body other than stimulated. When I come across art that I think is significant I always experience this and if someone experiences this looking at my work I think that the piece can be successful. Every moment of art that is magnificent and memorable encapsulates a series of questions and contradictions. I like to place these contradictions, questions and challenges face-to-face and see where the chips will fall. When I can recontextualize or re-imagine an ancient image I feel satisfied for a brief moment of time. I want to negotiate the idea of painting as photo and photo as painting. Through his writing, Georges Bataille represents the epistemology of unrestrained desire. When I work with images I would like to examine that idea. It’s the world, after Nietzsche, where God is dead and only Judgment and Exploration are valid. Bataille was concerned with the sensual and the psychological. I would like to apply his viewpoint to the physical world as well. An image can be obscene and a landscape can be pornographic. What are some of the memorable projects you’ve had? In which project can someone see the best of your work? I like the “Experimental” albums, I went out to photograph the area where I live in the style of the Impressionist Painters and it gave my work a different texture. I also like the work I’ve done based on Georges Bataille. I think he asked the most articulate, extreme questions to the soul of a human and I’m always fascinated by his responses. 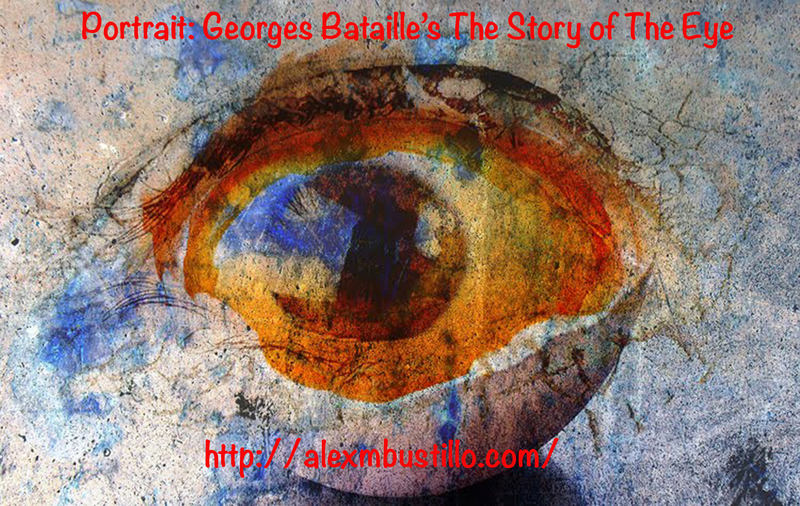 After reading “The Story of The Eye” by Bataille, the world was a different place for me. In the same way that watching David Lynch’s “Blue Velvet” or reading Umberto Eco’s “The Name of The Rose” did for me when I was younger and I lacked the lexical ability to process their content. How did you choose your projects, faces and photos you will make? I choose projects from books read, songs I listen to or ideas that I have floating in my mind. I think the most challenging is the concept of ideas because the visual aspect has to be discovered or created. If it’s a writer, a story or a book there are visual cues provided by the creator. When it’s an idea I feel as if I’m starting to paint in a vacuum. I don’t think that I re-write what I work on, but that I bring a personal interpretation. The more that I’m haunted by an image, the stranger, beautiful and dangerous image I can imagine. When it’s an artist or song that I love, I try to visually interpret what I listen to and all they ways in which I can imagine the images. The best moment is when a reader looks at an image and he can imagine what I’m trying to articulate. When it allows for a new reading or interpretation. Conversely, the worse moment is where there is no reaction. A positive or negative reaction allows me to see if I’m approaching the material in an accessible manner. A lot of times I do not specifically worry about that idea. I think the most satisfying moment was when Garland Jeffreys permitted me to work on his images. I asked him and he allowed me to do so. He did not give me any guidelines in how to approach them and he allowed me complete freedom in using them. I will always appreciate this gesture. Are there any memories from Garland Jeffreys, which you’d like to share with us? My memory of Garland is one of extreme gentleness. I remember when I first listened to “Don’t Call Me Buckwheat” which came out in 1991. I knew he was Lou Reed’s friend and that he was from New York but nothing more. There are very few times when I felt a chill going up my back when I listened to a new song. The first time was in 1980 when I heard “The Price You Pay” by Bruce Springsteen, then a concert recording of “Walk On The Wild Side” by Lou Reed and then the record version of “Don’t Call Me Buckwheat” by Garland. I was speechless. It was a personal song that had been lived more than written. Then he found the way to put pencil to paper. Garland is the best living American written on race relations in America. He knows that America is a beautiful palace that has yet to achieve its full promise. Which of historical personalities would you like to meet? What is your artistic DREAM? I don’t know if I would like to meet a historical personality. When I work with the idea of a personality I don’t think I meet the person. I recreate them in my mind. My artistic dream is to find a project where I can never finish. To find a project that becomes a project like Proust’s “Remembrance of Things Past” where the creation of a memory becomes the creation of something new. It took me many years to access Proust and once I had the feeling I was able to it changed the way I thought, I read and looked. I dream of finding such an overwhelming project. When you can’t see a limit you can not be limited. How does the music come out of your art and what kind of music you hear when you work? Music comes out of my work when I use it to articulate what I’m listening to. When I’m working on a musician, I don’t listen to that artic. I have my memory or idea and what I do is to extend what I think that they would have done. My work is marginal and non-canonical. I participate after the conversation. That does not bother me. When an artist creates, he wants to affect, touch, challenge, and overturn. In “The Postscript to ‘The Name of The Rose’”, Umberto Eco said that once a book is written, the writer should die to give free rein to the interpretation of the book. A book is a machine for creating challenging, offensive, contrarian interpretations. I take that liberty with my work. No apologies. What first attracted you to the Literary and how have changed your life? The literary is a way to intellectualize feelings and thoughts. The attraction still remains for me the possibility of a greater understanding of memories, ideas, narratives and thoughts. I know that this is an illusion but it’s a meaningful way to articulate a personal universe. Some music styles can be fads but the Blues, Jazz and Rock music is always with us. Why do think that is? The turn of a melody or a phrase is imprinted in our minds. Blues and rock are written in the language we think in and in the ways our muscles move so they stay with us. Jazz is created before it’s analysed, then it flows like a beautiful book that only we can read. Make an account of the case Literary, Music and Art. What characterize the sound of art and the art of music? I wouldn’t be able to do it in a general way but for my work, a song can be read like a novel and a novel can be listened to as a song. Sometimes, I work with the images of writers and other times with the images that they write into their works. A writer and a musician who is worth listening to has a particular voice and my job is to listen to that voice and to reply as faithfully and honest as possible. Reading a particular book is a moment in time and each book has a moment which imparts its most beautiful light. A good reader, listener or viewer is prepared to reap the gifts of song, lyric and text when they are offered without notice. Culture and civilization can confront the “prison” of the spirit and mind? Culture and civilization imprison us even to a greater extent. Everything becomes clear, structured, detailed, and programmed. The edge of culture and civilization is where creation and progress take place. That is why so many creators slip off the cliff or never reach the summit. Creation is a reaction against the void. When you face the void you can defeat it or be defeated. Defeat is a prison. As Minister of Education and Culture I would make it a requirement to make museums classrooms where students will interact with artworks face-to-face and I will expect them to be able to articulate their experience through writing or another type of behavior. Do you think that the ART comes from the heart, the brain or the soul? Art is a way of thinking about life. Sometimes it touches your heart; sometimes it demands that your brain examine it. I think the soul negotiates between the brain and the heart. I can pass years without listening to a song, then one morning I wake up and it’s the only thing I have in my ears. It floats in my brain until I can create an image that the song brings to me. Other times, I hear a song that I completely know and it is completely new ad I have to re-learn it. Then, if I try to create an image out of that it will something I had never imagined before. Art is the way we read a feeling with the tools that we have. The only advice that I can give is to explore what you’re interested in, push boundaries and limits and don’t stop until you can’t create anything else. The exploration of what you’re interested in is much more rewarding and educational than 25 at the best university. Challenge yourself and surround yourself of people who will challenge you more than you can challenge yourself. When you decide of what you’re interested in, absorb it in every media you can access it with and try to manipulate, treat, react and respond to it in as many formats as you can imagine. Which from THE FACES you made a portrait, had the most passion for the image & camera lens? The Beckett-Rothko portrait was a breakthrough image for me because it helped me visually articulate the direction I wanted to head in. Then, the process of selection and manipulation was delicate because I wanted to participate in the conversation without detracting from the original. And that has remained my original parameter in my work. Beckett and Warhol were very difficult to approach and I had to imagine how to manipulate them without doing violence to their work. It took me a long time to imagine and process but it’s what permitted to branch out across writers, musicians and disciplines. How you would spend a day with Bob Dylan and Ginsberg? What would you say to Dali and Ezra Pound? I don’t know if I would be able to do that. I understand that every story, novel, image and song has a context and a perimeter. Although my work reacts to that I don’t think that it permits my entrance. With Dylan, I’d love to spend the day listening to music with him. To borrow his ear for a day. With Ginsberg, I’d walk through his favorite bookstores or classrooms. I would remember I was but a visitor and I would feel that it was a privilege. What would you like to ask Beckett & Warhol? What advice would you give to Hendrix and Janis? I would ask Beckett what would be the first phrase he wrote after he died and whether he was satisfied with it. For Warhol, I would be curious as to whether his work was more autobiographical than hagiographic and if he would have liked to have preferred to create a crucifixion image based on his likeness or an image of the martyrdom of Saint Sebastian. I would have recommended to Jimi that he try a different instrument. I believe that the beauty of his ability could travel as easily through another instrument. I wouldn’t have been able to give Janis any advice. I would have brought her a cup of tea and imagined that she was Leonard Cohen’s Suzanne before she met him at the Chelsea Hotel. I would like to thank you for giving me the opportunity to talk about that which I most love to do. Alex’s work can be produced as photographic prints, plexiglas transparencies or mounted on aluminium sheets. Alex prefers the production of aluminium mounted prints because of the paintlike quality that it lends to his images. Please contact Alex directly for any additional information. Alex is an Open Networker and he looks forward to meeting you. Alex M Bustillo est un graphiste cubain américain natif de Miami en Floride résidant en France. Il a vécu aux Etats-Unis, à Puerto Rico, en Amérique Latine et en Italie. Alex traite les images photographiques comme des peintures à travers une grande variété de thèmes comme la musique, l’écriture, les voyages en Europe, l’architecture et l’histoire dont il s’inspire pour créer ses œuvres. Alex s’intéresse également aux écrivains et artistes modernes et postmodernes. Les œuvres d’Alex peuvent être produites en impression sur des supports photographiques classiques, en impression numérique sur du plexiglas ou sur des feuilles d’aluminium. N’hésitez pas à le contacter directement pour toute autre information complémentaire. Alex sera ravi d’entrer en contact avec vous.